The origins of Cornwall’s first railway to use wrought-iron rails and wagons with flanged wheels can be traced back to 1818. In 1825 it was completed, with horses drawing wagons from the mines around Gwennap to the port of Devoran. The line was successful and in 1854 it was converted for steam locomotives. The decline in Cornish mining fortunes led to its closure in 1915. The Redruth & Chasewater Railway Trail branches off from the Coast to Coast Trail at Twelveheads and follows a route of contrasting scenery (woodland and moorland) with spectacular views across Cornwall. Following as closely as possible the original railway route the trail bypasses the villages of Carharrack and Lanner. Gwennap Pit is close by and Carn Marth can be accessed from the trail. The trail then continues to the west of Lanner before connecting in to the Great Flat Lode Trail and Tresavean Trail at Welcome to the Mining Trails guide Buller Hill. The trail is based for the most part on the route of the original Redruth & Chasewater Railway. It is mostly level and off road, and occasionally crosses the public highway. Poldice Valley, has a long history of mining related industry dating back to at least 1512. Among the many remains including walled mine shafts and chimneys are what is left of the mid 19th century arsenic works where arsenic was condensed from gases into crystal form which was then exported across the world for use in insecticides and industrial processes, such as glass making. Notable minerals mined Galena, Pyrites, Wolfram, Arsenic & Ochre. 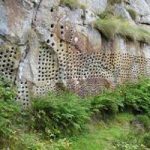 Harvey’s Quarry shows holes drilled into the granite rock by high pressure steam boring equipment manufactured by the world renowned Camborne company, Holmans. The drills made the job of extracting the stone a lot easier and the drills were used in mining operations throughout the world. 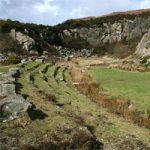 After the purchase of land on Carn Marth by the Protection Trust, the lower quarry was converted into an open air theatre. Despite a power failure half way through the first production held there (‘The Three Musketeers’ by the Cornwall Theatre Company), the performance was judged a tremendous success and the venue has gone from strength to strength showing drama, musicals and recitals. 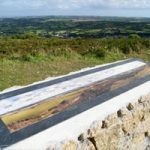 The view from the top of Carn Marth is outstanding when the weather is good and there is a diorama that tells you all the points you are looking at – from the north coast of Cornwall to the south coast.